MP High Court Civil Judge Result 2018-1- | Qualified For Mains Exam Out!! MP High Court Civil Judge Result 2018 @ mphc.gov.in declared here by the Madhya Pradesh High Court (MPHC) Board for the Judicial Service Madhya Pradesh Exam Held on 29th Sep 2018 for the posts of the 140 Civil Judge Class-II (Entry Level) Jobs., the MP High Court Civil Judge prelims Answer Keys, Cut-Off marks available in this Page. All the Details about the MP High Court Civil Judge Result and the further selection rounds will be intimated Clearly in this Page. So, candidates who have attended the Judicial Service Madhya Pradesh Exam, they can get the MP High Court Civil Judge Answer Keys to get the Candidates to score in a brief Manner. MP High Court Civil Judge Qualified For Mains Exam 2019 Released !!! Latest Update (14th March 2019):MP High Court Civil Judge Qualified For Mains Exam 2019 Released!!!. Check all the required Information end of this Page. MPHC Civil Judge Result is the most essential thing for the Candidates to step onto the Further rounds in order to Grab the Job Opportunities as a Civil Judge Class-II (Entry Level) Posts. 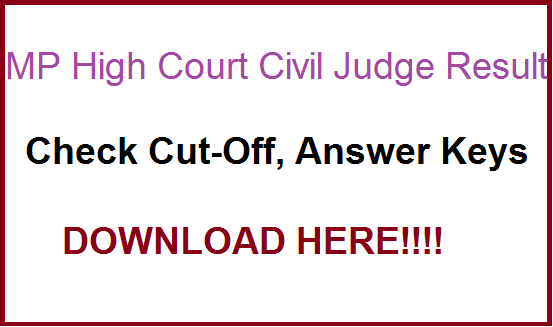 But in the Meanwhile Candidates also able to get the MP High Court Civil Judge Answer Keys Pdf Here. Answer Keys is available after the next day Onwards. Immediately they will declare the Answer keys for the Candidates checking Purpose. In which manner the candidates have attended the Examination. All the MP High Court Civil Judge Answer Keys downloading links will available at the end of this Page with the brief Description. Also find here from this page by getting the MP High Court Civil Judge Admit Card 2018 to attend for the Mains Cj 2018 exam. Candidates who are in dilemma to get the Judicial Service Madhya Pradesh Exam Result, they have to check the below-Given Links. On that first candidates have to click on that MP High Court Civil Judge Result Links. Now the Candidates Needed to enter the valid application or the Registration Number along with the Required Details that were asked in the Result Link. After entering all the Credential of the Candidates, they have to enter the OK Button. Now by submitting the Relevant Details, the MPHC Civil Judge Result 2018 @mphc.gov.in will be displayed on the Monitor. Check out the Qualifying Markis and then attend the further Rounds, if Candidates are eligible for the Job Opppotubtity. After getting the MP High Court Civil Judge Answer Keys, Applicants will search for the MP High Court Civil Judge cut-Off Marks. Because the cut-0ff Marks is the essential thing to get the Candidates names to be selected List for the sake of attending the further Rounds. We also provided the last Years MP High Court Civil Judge Cut-Off Marks. So that to estimate the Candidates maximum score in the Judicial Service Madhya Pradesh examination that the Candidates have appeared on 29th September 20118. Very soon in the month of the October 2018, the MP High Court Civil Judge Result is going to declare by the Madhya Pradesh High Court (MPHC) Board.